The new show at the Zack Gallery, Crossed Paths – which explores the connection between the Jewish and the Dene peoples – has its roots in the federal Mackenzie Valley Pipeline Inquiry. As a journalist, Wake accompanied Berger and his team on that historic trip. She taped numerous interviews with the local people participating in the inquiry. 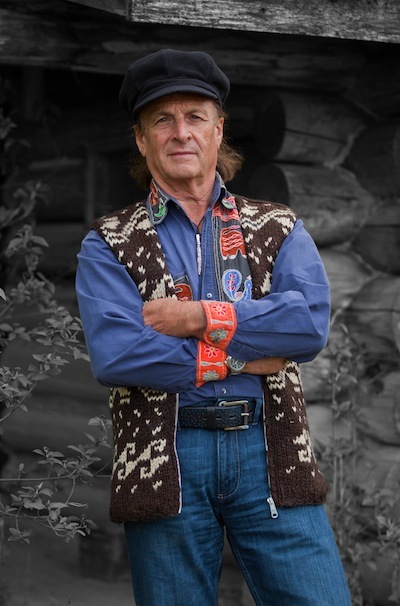 She invited a friend, photographer Linda MacCannell, to create portraits of some of the participants of the Mackenzie Valley negotiations. Over several years, they traveled to the villages Wake had visited with Berger. MacCannell took photos and Wake filmed her interviews. “We created a show of Linda’s portraits and the stories I collected and went on the road. By now, we’ve exhibited this show in 50 galleries across North America,” said Wake. 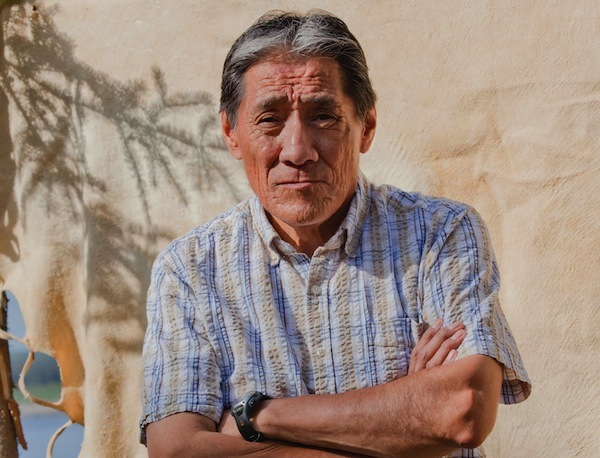 MacCannell’s large-scale portraits of various members of the Dene First Nations, who live along the Mackenzie River, constitute the heart of the exhibit at the Zack. Shumiatcher suggested they work together and present the exhibit to schools around the province. Wake liked the idea, and invited him to join her on her next trip north. Also joining the summer 2018 trip were artist Melenie Fleischer and her husband, cellist Eric Wilson, as well as composer Daniel Séguin. The group traveled to Fort Simpson, N.W.T., to study the drumming culture of the Dene in more depth. As well, Fleischer and Shumiatcher produced several paintings. A painting by Shumiatcher depicts Wilson blowing a shofar on the shore of the Mackenzie River. Fleischer and Wilson brought the shofar on the trip as a gift. The next step for the group was to approach the Zack Gallery for a joint show. The Jewish artists’ paintings complement MacCannell’s photography, showing another facet of the northern experience. Just as power and serenity dominate the portraits and the photographer’s triptych of the river landscape, the paintings add a touch of awe at nature and its symbiotic relationship with humankind. The Zack exhibit also includes traditional clothing made by several Dene artists. “Last year, we won a grant from the Canada Council [for the Arts] to commission northern artists,” Wake said. Of the pieces on display, each has a story. In some cases, the stories are real; they happened to the artists’ family members. For others, the stories are purely imaginary or are based on local folklore. Regardless, every story has a link to the tapes Wake collected in the 1970s and the people she interviewed. A pair of embroidered moccasins, made by Agnes Mitchell, is displayed in a plexiglass case next to the pair her father wore for years. The embroidery on the old moccasins – made by Mitchell’s mother – and the new ones is equally elaborate. Artist Jeneen Frei Njootli has brought the cloaks to life. 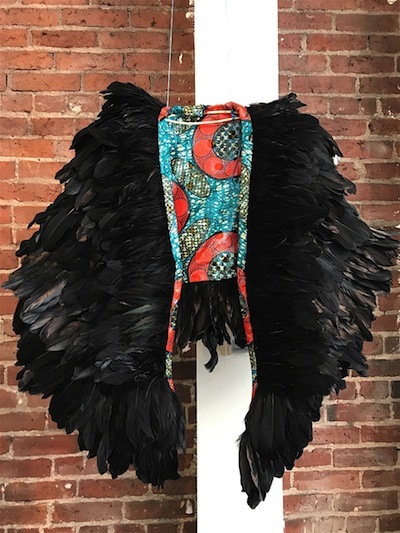 Her creations, a black cloak of raven feathers and another of white rabbit fur, hang in a corner of the Zack, one above another, as a tribute to her people’s tenacity and their drive to survive in the harshest conditions. During the Berger inquiry, Jackson befriended one of the local men, John T’Seleie, who organized his community to meet with the inquiry’s lawyers. The portraits of these two friends hang side by side on the gallery walls, and the film Wake made of her interviews with them is also part of the exhibit. Crossed Paths is at the Zack until April 7. Olga Livshin is a Vancouver freelance writer. She can be reached at [email protected]. Sidi Schaffer’s art has gone through several different incarnations. At the beginning of her career, in postwar Romania, she adhered to a realistic approach. “For several years, the central images of my work were people,” she said in an interview with the Independent. Her current show, In Partnership with Nature, which opened at the Zack Gallery on Jan. 31, combines her inclination towards abstraction, her love of nature and her ability to bridge the realistic and the spiritual in her paintings. It also highlights her innate optimism. The show is airy, uplifting and charming, the works prompting a quiet gladness in viewers. All of the images in the exhibit are mixed media. She experimented with acrylic and oil paint, with old prints and new drawings, with collage. The dried leaves or flowers form the heart of the compositions. Schaffer’s collaboration with the elements of nature tends towards whimsical. Flower petals float on the visual breeze. Mundane dandelions turn into exotic palm trees. Waves of musical notation sparkle with rainbow colours. Schaffer’s exploration into creative possibilities is nourished by her rich inner life. Before her retirement, she taught art and painted commissions, but never, for example, something made specifically to harmonize with anyone’s living room décor. In Partnership with Nature is at the Zack until March 3. 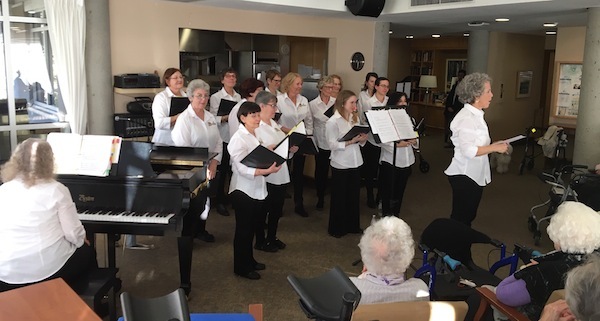 Temple Sholom Sisterhood Choir under the direction of Joyce Cherry with pianist Kathy Bjorseth performed an afternoon concert of Jewish music at the Weinberg Residence on Jan. 13. Featured were three works by Joan Beckow, a resident of the Louis Brier Hospital and a Temple Sholom member. Beckow was an active composer and music director in Los Angeles and, for a time, was Carol Burnett’s music director. The 23-voice Sisterhood Choir has sung for the annual Sisterhood Service for a number of years, but the recent concert at the Weinberg was a first for them outside of Temple Sholom. Some of the artists on opening night of the group show Community Longing and Belonging, Jan. 15 at the Zack Gallery. The exhibit marked Jewish Disability Awareness and Inclusion Month and ran until Jan. 27. 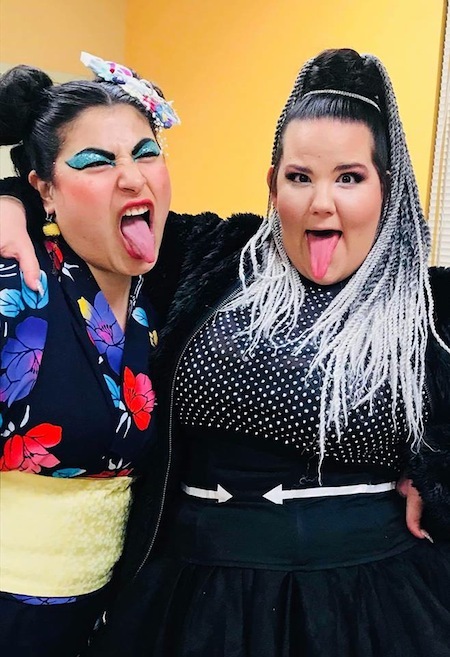 Eurovision 2018 winner Netta Barzilai, right, performed at the Jewish Community Centre of Greater Vancouver on Jan. 26 to help celebrate the 18th anniversary of Birthright Israel. Here, she is pictured with Carmel Tanaka, emcee of the night with IQ 2000 Trivia. The dance party was presented by the Jewish Federation of Greater Vancouver in partnership with Axis Vancouver, Hillel BC and the JCCGV. 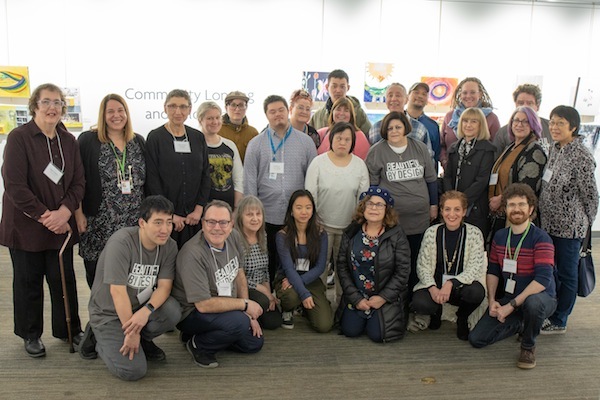 The group show Community Longing and Belonging, which opened Jan. 15 at the Zack Gallery, marks Jewish Disability Awareness and Inclusion Month (JDAIM). “I heard about community art shows in celebration of JDAIM in other communities,” said Leamore Cohen, inclusion services coordinator at the Jewish Community Centre of Greater Vancouver, who was the driving force behind the local exhibit. “I thought an unjuried exhibit would be a fabulous way to honour our community-wide commitment to remove barriers, to celebrate our community members’ creative capacities,” she said. The main idea was to open up participation to everyone – professional artists and amateurs, people of different skill levels, abilities, perspectives, faiths and socioeconomic status. The JDAIM inclusion initiative and month of advocacy began throughout North America in 2009, explained Cohen. The idea for the art exhibit started to take form last spring, when Cohen approached Zack Gallery director Linda Lando. The theme of community and inclusion prompted her next steps. She reached out to many different organizations and communities and invited artists from all over the Lower Mainland to participate. The call for submissions went out in late September, and the response was remarkable. Fifty-two artists are included in the show. “This show was a challenge and an invitation to look at social problems creatively and critically,” Cohen told the Independent. “It was also an opportunity for artists living with diverse needs to exhibit their work in a professional venue and to receive exposure. 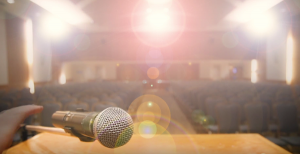 Cohen shared one example of how the show’s theme relates to her own life. The theme allowed for a number of different approaches, and the skill of the various participating artists varies widely, but the utter diversity becomes its main attraction. Although the size and shape of the canvases – the wooden boards provided by the organizers – are universal, the content is anything but, and so is the media. Some pieces are oils, others acrylic; still others, mixed media. There are abstracts and figurative compositions. Some have narratives. Others evoke emotions. Some have Jewish connotations. Others don’t. Some artists participated solo, while others enrolled as a family group. Marcie Levitt-Cooper represents one such family. Her painting “Open Doors” depicts a colony of colourful birdhouses. Every door of every birdhouse is open, creating a welcoming avian village, a festive metaphor that makes you smile. No birds appear in the image, but you can almost hear them sing. The artist’s three daughters – Rebecca Wosk, Teddie Wosk and Margaux Wosk – also exhibit in the show. Another family of artists is mother Elizabeth Snigurowicz and son Matthew Tom Wing. “They regularly come to the Jewish Community Centre inclusion services Art Hive drop-in program, a low-barrier, free art program,” said Cohen. 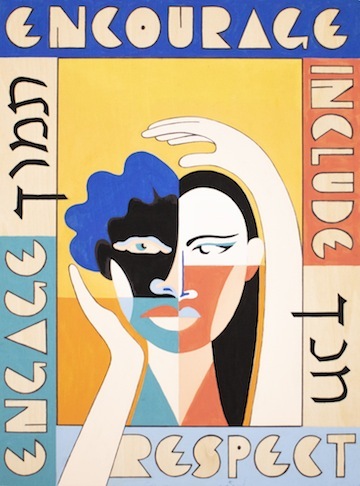 In Evelyn Fichmann’s painting “Embrace,” the artist, a recent immigrant from Brazil, has incorporated words in English and Hebrew. “Encourage,” “include,” “educate,” “respect,” “engage” and “support” surround the image, all fitting descriptors of what we should strive to do in our communities. Community Longing and Belonging runs until Jan 27. The impacts of the Holocaust continue to reverberate. Even though most of the first-generation survivors have passed away, the next generations, the survivors’ children and grandchildren, remember. Local artist Olga Campbell belongs to the second generation. Her parents survived the Holocaust, but her mother’s entire family was murdered by the Nazis. The need to give those family members a voice was Campbell’s driving force in writing her new book, A Whisper Across Time: My Family’s Story of the Holocaust Told Through Art and Poetry. 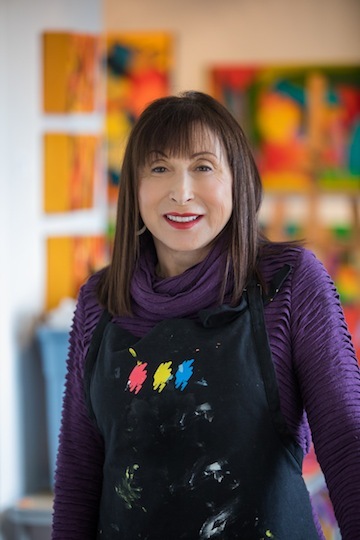 Her solo exhibit with the same name, co-presented with the Cherie Smith JCC Jewish Book Festival, opened at the Zack Gallery on Nov. 15. The night also served as a book launch. Campbell has always known that her mother’s family didn’t survive the war, but the emotional impact of their deaths built slowly over the years. It took decades for this book to emerge. She embarked on an artistic journey, and she is still following a path of exploration. Her art reflects her emotional upheaval. Her paintings and statues are fragmented, with broken lines and distorted figures, evoking feelings of loss and anguish. One look at her paintings and a disquiet tension washes over the viewer. It is apparent that a huge tragedy inspired her work. Unfortunately, she knew only the bare bones of her mother’s life. So she plunged into a deep and long research period, surfed the internet, contacted Yad Vashem and other sources. After several years, the book crystallized. “My book is a tribute to my family, the family I never knew,” she said. She created new art for the book, wrote poetry to supplement the imagery, and also included an essay on her family members and their lives, destroyed by the war. The paintings in the book and on the gallery walls are powerful but melancholy, even distressing. When the book was ready, Campbell applied for another show at the Zack, to coincide with the book launch. “I wanted to give it the same name as the previous show, Whispers Across Time,” she said, “but I checked the internet, and there are a couple other books already published with the same title. I decided to change it.” The book and the show are called A Whisper Across Time. “I feel a lot lighter now, after the book is finished and published,” she said. A Whisper Across Time is Campbell’s second publication. In 2009, she published Graffiti Alphabet. She has been doing art for more than 30 years, but that is not how she started her professional career. She was a social worker until, in 1986, she took her first art class. That year changed her life. Campbell finished the art program, continued working part-time as a social worker, and dedicated the rest of her time to painting, sculpture and photography. The A Whisper Across Time exhibit continues until Dec. 9. For more about her work and books, visit olgacampbell.com. The latest show at the Zack Gallery, Heart to Heart, presents the work of two artists in two vastly different media. Claudie Azoulai makes felt tapestries, while Nicole Schouela specializes in photography. Despite the differences in material representation, however, the colour palettes and the themes are amazingly similar – places close to their heart, places that invoke love and peace. The places and the emotions they inspire consolidate the show into a seamless, cohesive whole. All of these pieces are related to a children’s book Azoulai has written. “The book will be called The Spring Feast. It’s about the flora and fauna of Hornby Island, one of my favourite places. I will photograph every tapestry here, and they will be the illustrations for the book,” she said. Azoulai considers herself a part of the great pageantry of life, and Hornby Island provides her with the opportunity to experience it firsthand. 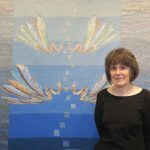 One of the tapestries, “Herring Run,” reflects her connection with nature. She frequently experiments with new materials, incorporating silk or synthetic particles into the base of wool to add a shine or a different texture. “As long as the fleece entangles the other threads, the image stays together,” she said about that technique. 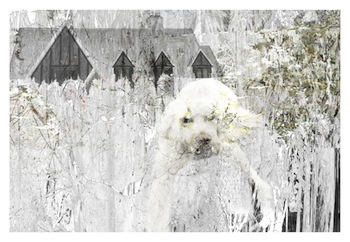 Mixing and matching is also Schouela’s preferred technique, using Photoshop to work with different parts from a multitude of photographs. Schouela started her artistic life as a dancer, but dance is an unforgiving art form that takes its toll on the body. She switched first to ceramics, and later dedicated herself to photography. In everything she creates – a dance or a vase or a photo collage – there is movement and transformation. The images flow through each other, striving towards abstraction and emotional truth. “Perceived Threat” by Nicole Schouela. Schouela’s abstract compositions on the gallery walls lean towards pastel or black and white, with occasional splashes of bright colour. Some are geometrical. Others tell a story or convey an emotion. The exhibit Heart to Heart opened on Oct. 11 and continues until Nov. 9. To learn more about the artists, check out their websites: claudieazoulai.com and nicoleschouela.com. Barbara Heller’s new solo show at the Zack Gallery, Divine Sparks, could be divided into three distinct themes, each one representative of a world culture: the Sephirot, the Mudras and the Future Reliquaries. Each of the three resonates with one of three religions, Judaism, Hinduism and Christianity, respectively, but Heller, a master weaver, sees divine sparks everywhere. Her tapestries, big and small, invite gallery guests to contemplate what unites us, no matter our ethnicity or religious affiliation. Symbolism infuses Heller’s images, starting with the centrepiece of the show, “Tzimtzum,” or “Transcendence.” The large tapestry is a stylized ladder. The midnight blue rungs at the bottom coalesce into a dead bird, but the higher your eyes travel, the lighter the colours become. Two pairs of wings punctuate the climb of colours from dark indigo to white radiance. Heller has shown this tapestry at several exhibitions already, to great acclaim. Recently, it won the American Tapestry Alliance Award. 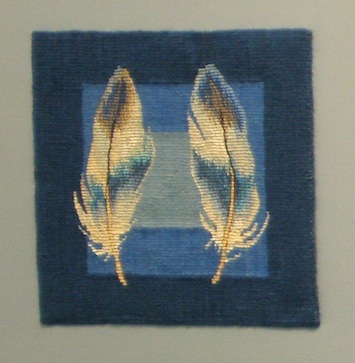 Barbara Heller made a series of small tapestries of her feather collection, Sephirot, specifically for the Zack show. Since the plan involving the real feathers fell through, Heller made a series of small tapestries of her feather collection, Sephirot, specifically for the Zack show. “I already had lots of yarn died blue for the ‘Tzimtzum,’” she said. She called the series Sephirot after the kabbalah’s spiritual qualities of understanding, wisdom, love and judgment, among others. The second series in the show, Mudras, obtained its name from the hand gestures prevalent in Hinduism, Asian dancing, yoga and meditation. Heller’s Mudras is a series of small, uniform-sized round images of various hand gestures. The hands are woven of golden yarn and appliquéd to dark-green fabric with a vague “computer motherboard” pattern. Parts of real electronics – wires, chips, connectors – are incorporated into the design of every gesture, as if to emphasize the similarities between computer circuits and the neuron circuitry in our brains. The other series, Future Reliquaries, is an older one. Also depicting hands embedded with parts of electronic devices, it reflects humanity’s developing love affair with technology. Several tapestries of the series are rather large. In each one, a human hand in golden yarn stands out from the background of an ancient traditional pattern. “Different tapestries sport different patterns: from Persia, Indonesia, Turkey, Navajo,” Heller said. Like in the Mudras series, the interlaced computer piece are symbolic of our interconnection with machines. Beside the large hands, there is also a selection of tiny ones, where each miniscule woven hand is linked to topics such as keys or clocks, science or beauty, birth or death. Heller’s exhibit is part of larger happenings in Vancouver this month – a symposium of the Textile Society of America. The symposium takes place Sept. 19-23, and many galleries around the city besides the Zack are displaying textile or weaving exhibitions to coincide with it. As a well-known local artist, Heller has been one of the event organizers from the beginning. “We have a wealth of local textile artists, and about 400 people are coming to the symposium from all over the world,” she said. So, now, the first day of the symposium falls on Yom Kippur, as other reservations were not available, and the society has posted an apology on its website. 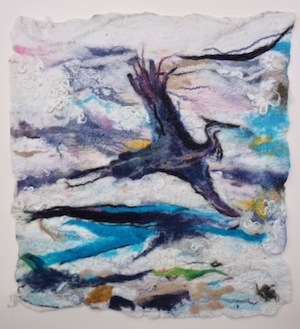 The Zack Gallery offers a bus tour of three textile exhibitions in the city on Sept. 20. To learn more about the tour and to register, visit jccgv.com/art-and-culture/gallery. For more about Heller, visit barbaraheller.ca. Divine Sparks opened on Sept. 6 and continues until Oct. 8. The latest show at the Zack Gallery, Celebration, showcases two artists, Melanie Fogell and Frank Levine. At first glance, they don’t seem to have much in common. Fogell’s art is bright and flamboyant, totally abstract, and her canvases are large, while Levine’s paintings are generally smaller, more intimate, his colours more muted and his compositions tend to have recognizable figurative patterns: people, musical instruments, landscapes, cityscapes. However, both artists celebrate life through their paintings. For years, both approached art as a hobby – it is only recently that Fogell started painting full-time, while Levine still works as an accountant. Both artists also lived for some time in Gibsons, B.C., where they met a few years ago. Fogell still lives there, while Levine has moved to Richmond. Levine’s life has involved several drastic moves, geographic and professional. Born in England, he received his art education in London. He majored in fashion design. Upon graduation, he opened his own fashion boutique in London, but that didn’t last long in the cutthroat industry. After that, he worked for 10 years as a clothing designer for a large factory in the city. After a decade of the stress and screaming, Levine switched to accounting, which he considers an occupation much less taxing on his nerves. In 1978, he moved to Canada and settled in Vancouver. “Antisemitism in England was a consideration in my decision to move,” he said. Wherever he has lived, and whatever his day job, he has kept on painting. One of the paintings in the show, “Prism,” came from one of those weekly sessions. The small image features a blue-and-gold cityscape, happy and bright, vaguely reminiscent of a Greek city. “My son suggested the theme of prism,” said Levine. Many of the artist’s paintings are landscapes, but he portrays them through a mesh of geometric figures. The lines creating the geometric patterns add mysticism to the trees and lakes. “I’m drawn to the images that have passion, not something everyone would paint,” he said. Whatever his brush depicts – his backyard in Gibsons with a visiting bear, a small café in the Luxembourg Gardens in Paris or picturesque gates in China – his love for the places shines through the canvas. Over the years, Levine has participated in several exhibitions in Gibsons and has had his paintings displayed at a Richmond community centre. This Zack Gallery show is only the second time in Vancouver that the public has had a chance to admire them, and it is his first exhibit in a Vancouver art gallery. Unlike Levine, Fogell is well known on the Vancouver art scene. She had a solo show at the Zack in 2011 and another one in 2014. Her early art education at Emily Carr University of Art + Design could have led to a career in the arts, but, like many others, she discovered that it was extremely difficult to make a living as an artist. She became a piano teacher instead. Years later, Fogell went back to university for a master’s in women’s studies and then did a PhD in educational research. 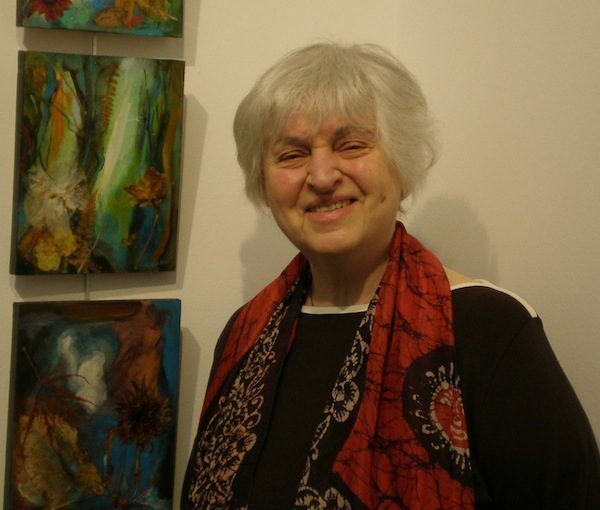 She has taught women’s studies at the University of British Columbia and piano as a private tutor, but, throughout the years, just like Levine, she has never stopped painting. She loved art too much, and the need to express herself through imagery drove her to paint. She paints full-time now. Fogell’s paintings burst with primal colours, and her ovals seem like gladness enclosed, surrounding the viewers like a collection of exuberant eggs, or new leaves shimmering in the sunlight, or a field of tulips swaying in a breeze. They promise renewal and hope. “I paint how it feels to be connected to everything in my life, both present and past,” she said. The exhibition Celebration opened on Aug. 9 and continues until Aug. 31. For more information, check out the artists’ websites, melaniefogell.com and franklevineart.com. 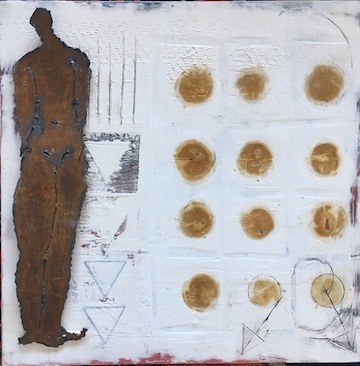 Carly Belzberg is a Zen practitioner, and her art reflects her beliefs. Her solo show at the Zack Gallery – The Spirit of Cloud, The Spirit of River – is all about change. Part of what comes out for Belzberg is her art. Colours and lines coalesce and crisscross in her abstract images of movement and form. The paintings represent the essence of change, as she sees it. Her path to this exhibit was as complicated as a water drop. She grew up in Vancouver, then studied at Concordia University in Montreal, Drexel University in Philadelphia and, later, at Simon Fraser University. 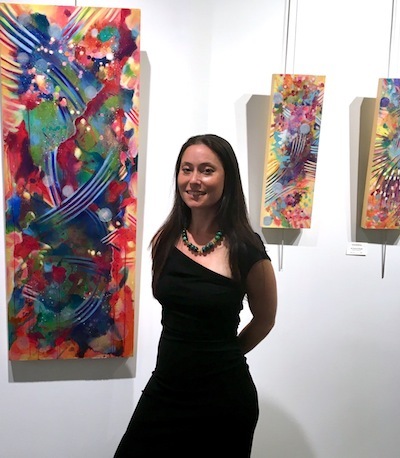 With a bachelor of fine arts and art education and a master’s in art psychotherapy, she started her working life in Baltimore as an art therapist. Her work in Baltimore was in crisis intervention and with elderly dementia patients. She loved both sides of her job. While she kept on painting all that time, her focus was on building her art therapy career. Like many hobbies, her painting became relegated to the sidelines of her life. After awhile, she moved to Winnipeg and, a few years later, around 2007, returned to Vancouver. Unfortunately, between her work for the Vancouver School Board and her private therapy practice, she couldn’t seem to find a place for her own art. Then, about three years ago, things changed. Since their first meeting, the two have become such good friends that Marczak helped Belzberg hang the paintings for her Zack show. About the same time, Belzberg made a serious commitment to studying Zen. This also led her back to her artistic core. Despite the prolonged period of partial withdrawal from the arts, Belzberg has had some sales and commissions over the years. One of her biggest commissions was the purchase of 14 paintings for a nursing home in Winnipeg. But she doesn’t paint for money. The Spirit of Cloud, The Spirit of River exhibit opened July 5 and continues until Aug. 3. For more information on Belzberg and her work, visit carlybelzberg.com. Diana Zoe Coop paints gardens. She paints them on canvas and paper. She paints them on costumes and wall panels. Her new show at the Zack Gallery, The Artist’s Garden, is an explosion of colours and shapes that sprout not only from nature, but from the garden of the artist’s imagination. 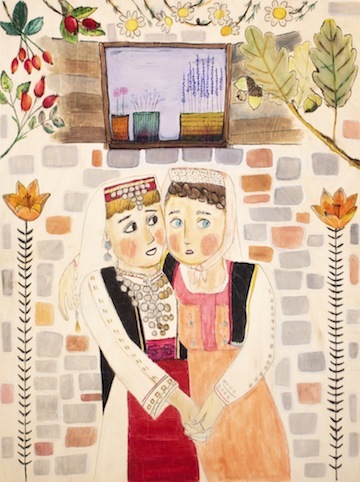 “All my life, I painted,” she said in an interview with the Jewish Independent. She studied for her bachelor of fine arts at the University of Manitoba, continued her education at Syracuse University in New York and finished her postgraduate specialty training at Saint Martin’s School of Art in London, England. She graduated with a degree in printmaking and thought herself more a graphic designer than a painter, but, as time passed, she gradually switched to painting. During her most recent trip to Mexico, in 2016, she visited Frida Kahlo’s home. Again. Coop’s paintings explore far beyond blue. In the gallery, her pieces are an explosion of hues and forms, bright arabesques of brushwork interspaced with dazzling sprinklings of gold and silver. The collective work is the representation of a garden through the lens of the artist’s perception. 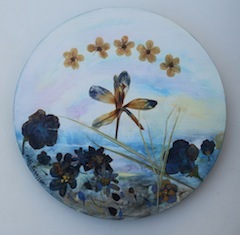 Many of the images in the show are mixed media collages, with pansies applied to the paint and bright crystals bringing sparkle to the compositions. “I grow pansies in my garden. It’s not easy to care for them, especially through the winters, and I do need many of them for my paintings,” Coop said. Coop also uses art to convey her memories of “the myriad experiences of decades of relationships. And, most sadly, the profound losses of people I loved,” she said. “There were friends who passed away before their time, far too early and far too young. “Roberta Mickelson inspired me to paint the wild gardens of my discontent and my anger, an anger directed at the unfairness of her life cut short. She was a talented artist herself, and it pained me to think that she could not paint anymore. Coop’s works hang in private and corporate collections in Canada, the United States, the United Kingdom, the Netherlands, Italy, Australia, Bulgaria, Poland, Czech Republic, Austria, Serbia, France and Finland. But painting pictures is only part of her creative journey. She also designs unique costumes for rhythmic gymnastics, dance, circus, aerial and skating. For years, many Canadian athletes wore her designs at international competitions, including at the Olympic Games. “A girl gymnast once saw my paintings and said naively that they looked like her costume. I didn’t have the heart to tell her it was the other way around,” Coop said with a smile. The Artist’s Garden exhibit continues to June 29. To learn more, visit the artist’s website, dianazoecoopartist.com, and her costume design site, zoeycouture.com.